Taison Auto by VIP Seeds is the genetic blend of Purple Kush with other auto-flowering hybrids from Russia. This strain retains the potent strength, hard buds and stunning purple foliage of its parents, making it a perfect choice for those looking for an autoflowering version of an all time classic. The parent plant Purple Kush originates from California where it has a reputation amongst medicinal users. It is a favorite and sought after strain in the legal dispensaries around the state – so you can be certain that Taison Auto will not fail to impress. This highly demanded strain takes after Purple Kush in both smell and taste - dank and hazy. It will induce a knock-out stone that will numb mind and body. It is great at the end of a day, just before you turn in for the night. It has a real potential to couch-lock you, letting you aches, pains and worries slip away. As previously mentioned, this strain has exceptional medicinal properties due to the sheer potency of the product. It is the ideal choice for those looking for pain relief or those having difficulty sleeping. This indica dominant hybrid is well suited to outdoor and indoor growth. It has a high resilience to fungus and pests making it an ideal choice for those looking to grow outdoors in warmer climates. Taison Auto grows short and stocky due to its indica heritage. 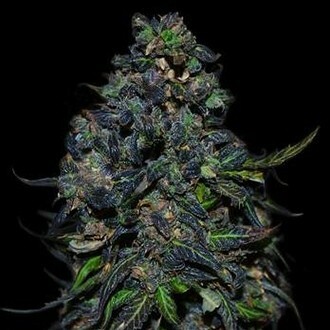 It grows tightly packed deep purple buds covered in hair that give it a stunning appearance. The resilience, ease of growth, large harvests and strong product make it a great all rounder – it will have something to suit any type of cultivator. Taison Auto by VIP Seeds is suitable for indoor, outdoor and greenhouse cultivation. Plant heights reach 0.8m on average and harvest times are around 60-65 days for optimal yields. For your time and effort you can expect an indoor yield of 550g/m2 and an outdoor yield of 50-600g per plant. Taison Auto has a very high THC content, so novice smokers should approach with caution and ease themselves in gently. De zaadjes waren vlug geleverd. Plantjes doen het goed. Over smaak en eindproduct kan ik nog niet oordelen. Daar moet ik nog een week of 6 op wachten. Thx voor de extra zaden. Les graines germent rapidement et les plantes offrent une bonne croissance ainsi qu'une herbe de bonne qualité. Pensez à augmenter la taille des pots régulièrement elle ont besoin de beaucoup de place, 21L après 2 mois. Von 6 Samen sind 5 aufgegangen. Die Pflanzen bleiben klein, sind widerstandsfähig und leicht zu growen. Jedoch ist das Ergebnis zu schmal. Ca. 10g pro Pflanze, sowohl indoor als auch outdoor ist zu wenig. Ca. 50% wurden violett. Ich werde diesen Strain nicht mehr anbauen. Despite being able to identify possible causes (soil pH, moisture, insufficient natural lighting) for the disastrous growth (where only 1 seed survived out of three and has since stagnated growth for 3 weeks), I would not go for a proper round of Taison again. In comparison, when the seeds were planted, I also planted in 3 other pots Habanero and Bolivian Rainbow chilli seeds, who have had the same growth conditions as the Taison. Somehow so, the chilli seeds continued growth as expected while the two Taison seedlings died a short while (1-2 weeks) after sprouting. As an useful FYI, I have been doing in-door growing of various plants and flowers for years as a hobby. Try out another strain is my call. Sehr schnelle Sorte! 3 von 3 gekeimt ! Für den Preis unglaublich!